One of the things I knew I wanted to do after adding Shirou and Teresa to the Sprites series was make sure that there were a few different versions of them for people to chose from, so this is the second Shirou paper doll. It’s a much more rough and tumble option than his rather properly dressed counterpart from April, but that was part of the point. Variety is, after all, the spice of life. I did try out some wilder hair colors, but in the end I really liked the black hair with the black facial tattoo. After all, it is critical to match your hair to your facial tattoo, don’t you know? Meanwhile, his outfits are actually in some of the same shades as Willow’s outfits from yesterday. I wanted them to coordinate without being too matchy-matchy. My favorite of today’s paper doll tattoos is the lace design around his ankle. To really see it, you’ll probably want to look at the larger version. 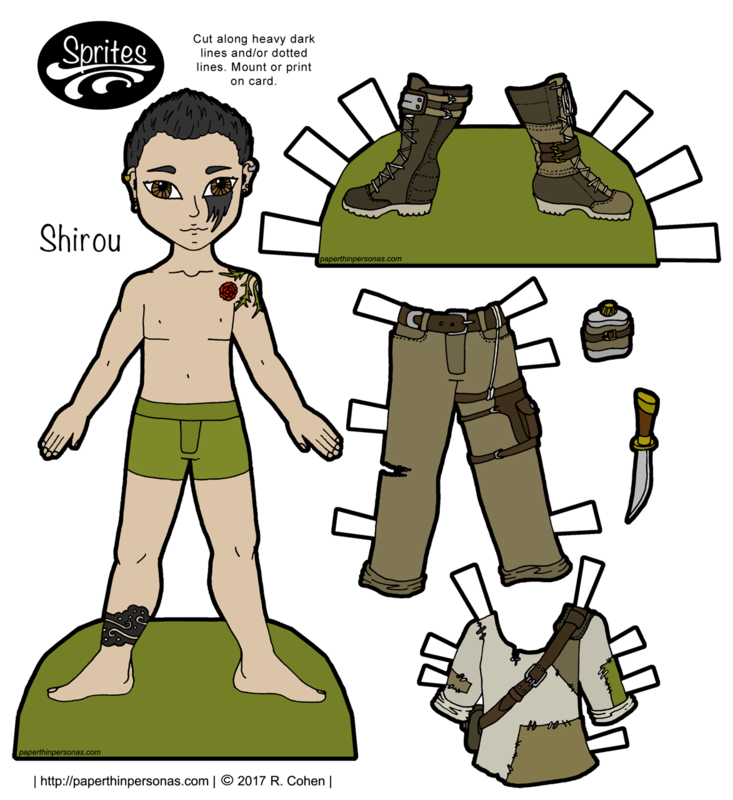 What do you think of today’s Sprite paper doll? Let me know in a comment. I always love to hear from you all. the patchwork shirt is great! and i like that he’s a bit matchy with willow!